Last month’s analysis called for a further move up in all asset classes and the markets have served up healthy results. As we’ve marched into the highs made on August 25th in the S&P 500 at 1038 the index retreated to where it stands at todays close right at 1000. 30% to 40% of the rally has been a result of simply removing the catastrophic collapse option from the system. The remaining 10% or so can be understood as growth based on feelings of improvement in the economy. The rally we’ve witnessed has been the result of pricing all assets as though the end of the financial world was at hand (it was). Since the not so invisible hand of the government intervened to save the system, we’ve ridden the wave of excess government liquidity back to levels not seen since last September. Throughout the impressive rally bears have doubted the fundamentals and conviction of the bulls and have been the fuel source, pushing us to these levels. Employment in August is still sour as we lost 216,000 jobs, however this rate of job loss is significantly lower than the 650,000 losses we faced a few months ago. Our current unemployment rate is officially 9.7% as provided by the US Bureau of Labor Statistics. When you include job seekers that have given up searching or are “under employed” in part-time jobs, our unemployment rate is over 16%. The unemployment data is difficult to trust simply because the government doesn’t count folks that have stopped looking for jobs. These are the people that would probably work, but the prospects are so bad they simply quit the search. Railcar shipping data through the August 29th shows some improvement in shipping rates, but comparisons to last year still reveal how much of a downward shift we’ve seen. Transportation data often gives us a leading indication of recovery especially when you drill down to components like crushed stone and lumber. Last week’s information reveals that there has not been a recovery in these products. Shipping of these building inputs show that commercial and residential construction is not improving. We will probably begin to see further improvement in rail traffic as we see restocking of automobile inventories sold in the Cash for Clunkers tax money give away. The trick will be not to read too much into this data as we’ll see those cars sit on lots for an extended period of time. The Bloomberg Financial Conditions Index combines yield spreads and indices from the Money Markets, Equity Markets, and Bond Markets into a normalized index. The values of this index are z-scores, which represent the number of standard deviations that current financial conditions lie above or below the average of the 1992-June 2008 period. A value over 0 indicates an expansion and an end to the recession. Values under 0 show recessionary tones in the economy. The Financial conditions index continues to improve suggesting that credit concerns have abated. As you can see from the chart, data in mid October of 2008 revealed how bad financial markets were at the time. We are still below zero and can’t proclaim the end of the economic turbulence and liquidity crisis. Data provided by the group ECRI tabulates their Weekly Leading Indicator index. In crisis, the WLI turned down in October right before the decline and up in February before the market’s swing higher. The WLI continues to improve suggesting that the economic rebound is real. In addition, their data indicates that inflation is not currently present. The Dow Jones Economic Sentiment Indicator moved higher for the sixth straight month to the 35.5 level. Data under a level of 50 indicates there is danger of an economic slowdown which we are clearly in at this time. We need to continue to watch this upward sloping data. The movement of the market last week helped to remove some of the bullishness and euphoria in the market. The AAII sentiment ratio was close to the 30 line last week indicating that everyone was happy. As usual, we would use this indicator to take the opposite side of the trade. When everyone is feeling one way, it is usually safer to bet against the crowd. Given the return to the mid range, we don’t glean much from this chart other than a confirmation of our feeling that the market was overbought. CFO Survey – Like the market recovery the June release of the CFO Survey backs up what we have witnessed in the economy so far. CFO’s are feeling better than they were, but still reserved in their outlook. Because this data is from the June release, we’ll be carefully watching for the next quarterly update to see if the trend continues. MIT Center for Real Estate has supplied us with information about the first and second quarter pricing on commercial real estate transactions. In the graph below, we continue to see the pricing waterfall as deals are getting done at lower and lower levels. Second quarter data shows a pricing drop of 18.1% from the previous quarter and almost 39% lower prices from the peak in 2007. We must continue to watch this data as commercial real estate is the wound that could still kill the patient in terms of this recovery. At the local level, community banks are impaired because they are facing losses on their commercial real estate loan portfolios. Bankers over emphasized these loans and are paying the price for their over zealousness. We will continue to see banking failures and the pace will hasten. Larger regional players like Zions Bank and Regions Financial are in serious trouble and have disclosed serious asset impairment. I will not be surprised to see an arranged marriage of these two banks with larger national institutions backed by the FDIC soon (your tax dollars to absorb the losses of course). We do not see any improvement in these trends and in fact the downward pressure on CRE pricing will accelerate. Retail sales continue to falter. Total sales decreased .1% from the previous month and were -9% from last year in July. The US dollar continues its slide. As it goes lower, the world adjusts asset values higher to compensate the erosion of value in the home currency. In other words, (in a perfect world) if the dollar goes down 1%, the value of companies (stocks) should rise 1% to compensate for the dollar’s decline. The same can be said for gold, oil, and other commodities priced throughout the world. Prices seem more expensive to US consumers because they are losing purchasing power. The dollar’s impact on pricing of the stock market and the commodities market is so influential now and I would suggest that much of the moves in the markets are almost based on the fall of our currency. July consumer credit outstanding was released this week and noted that consumer credit outstanding dropped $21.6 Billion for the month. This is concerning because our government’s plan to revive our economy centers on the resurgence of the US consumer. Rescue packages like the $8,000 home purchase tax credit and Cash for Clunkers are significant pieces of the revival plan. The destruction of consumer credit is driven by several key components. First, consumers with jobs are paying down debts as fast as they can. Second, consumers are refusing to spend using credit cards and loans (if they have access to them). Third, consumers are just not spending and delaying purchases or becoming accustomed to a new life style without instant gratification. Finally, there is another growing segment of consumers that are jobless, without credit, and without means to buy even if they wanted to. As we pour through the economic data above you might get the feeling that the economy has had its better days. Facts show that consumer credit outstanding is still declining; unemployment is still rising, retail sales dropping, and rail shipments of construction inputs are still in a flat-line. Despite these sour tones, there are hints of recovery. ECRI data shows that the Weekly Leading Index is still heading higher, the rate of job loss is slowing, and company leadership also states that there are improvements coming. Americans that are working are more productive than ever and there are available stimulus plans to propel purchasing in targeted areas. Given the prospects of further improvement in the economy, we continue to feel that there are opportunities in various markets in the short run. I hear daily that the market is “priced to perfection”, and in some sense those comments are correct, yet they are not factoring in new data. I agree that for the information we have, we have moved up significantly. Remember though, we were pricing in the apocalypse. As more information reveals the continuation growth, I suspect that we’ll see more moves to the upside as the market is caught off guard. 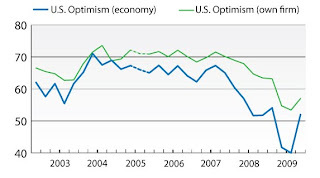 An example of this is the following chart; again from ECRI. The orange line suggests an upturn in pricing in the housing market. A few more weeks of good data here will underpin more upside as this will show that housing may be bottoming. No doubt we'll see more foreclosures and a release of inventories that are building up on bank balance sheets. However, our focus in this discussion is on the next month or so rather than the next six months. We continue to favor weak dollar plays in the market. If you have the ability to short the dollar or go long other currencies, there is no reason to fight an obvious trend. Stabilization of the dollar is important for the health of our economy, but until we see real intervention from the Fed or the Treasury to prop up the dollar, we must assume that they are paper tigers. As we’ve said often, the FED is motivated to have consumers spend every dime they have and also are committed to devaluing the dollar so that our debt is worth less. In response to the weak dollar, we will see equities move higher, metals, oil, and emerging markets. We will revisit these trades monthly, but as long as the dollar falls, these trades will be effective. Areas to avoid continue to be in the financial and commercial real estate sectors. No matter how far these run, they will be the center of the next liquidity event that may happen in the winter or early next year. Don’t mistake our short term view with a positive long term outlook. We still are of the opinion that the early months of 2010 will bring significant challenges for the markets and the overall economy. If any significant changes happen in the dollar environment, do not hesitate to move to cash or if you are in mutual funds to US Government Securities that have short term maturities. This is a toppy market so you must be nimble. Establish thresholds for maximize loss before you enter trades and exit those trades if you exceed your limit. By the way, I know there are folks following on Twitter, I noticed that there is a follow me button here on this blog. Please use that to know when I post each month or intra-month.